This is one of Köpf’s most attractive still life paintings. He often painted arrangements of objects on a shelf or table set against a wall, widening out by degrees to take in the corner of his studio or a whole room. These works usually have a generalized colour harmony, but none so pronounced as the symphony of blue, white and cream he composes here. 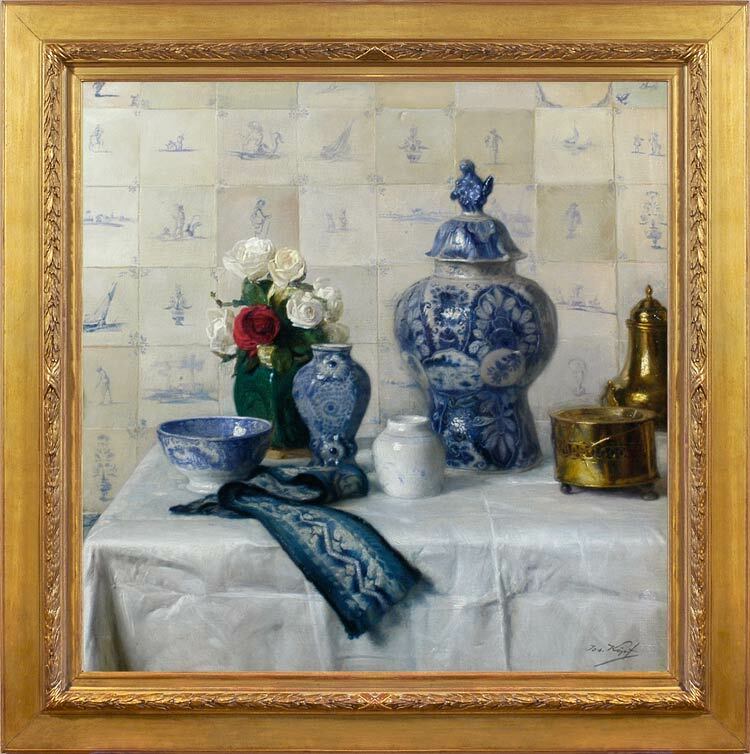 The Delft tiles, with their varied motifs, glazes, chips and discolourations form a softly nuanced background to the group of blue and white Chinese vases, which include a lidded vase (probably of the 1860-90s), a small ginger jar, and a bowl. The yellowing glazes of the tiles are picked up in the brass and in the cream roses, whilst the single red rose lifts and animates the composition. The linen tablecloth is a tour de force of still life painting, as are the subtly varied reflective surfaces of the porcelain and the metal. Josef Köpf was born in Vienna in 1873, and is best known, according to Benezit, as a painter of architecture. He studied at the Vienna Academy of Art with J. M. Trenkwald, Pockwalski and Sigmund l’Allemand, and travelled to France and Holland on numerous occasions. He took part in many exhibitions in Vienna, winning the Golden State Medal, the Prize for the City of Vienna and the Golden Laurel of the Vienna Artists’ Unit. He was elected a member of the last in 1903. He also apparently exhibited abroad, and became well-known for his paintings of interiors, still life works and landscapes (Boris Wilnitsky Fine Arts; Leon Wilnitsky Alte Kunst, Vienna). He took part in the 1909 Exposition in Berlin, but otherwise records on his work are scant, especially for a talented artist who lived until he was eighty. He used both oils and watercolours, producing many interiors in his home and studio, where the same props appear in different arrangements; he also painted religious works and nudes.